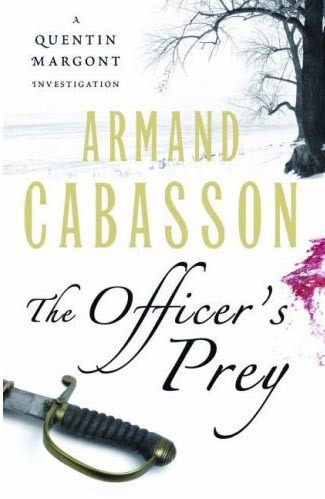 THE OFFICER'S PREY by Armand Cabasson, published by Gallic Books, is a thriller which unfolds in Poland and Russia, following the course of Napoleon's ill-fated Russian campaign. Captain Margont, the hero, an idealistic French army officer, is under orders by Napoleon's son-in-law Prince Eugene, to investigate the brutal murder of a Polish female servant. Since the murder appears to have been committed by a high-ranking French army officer, Margont has to carry out the investigation as discreetly as possible. Margont, aided by his friend and comrade Lefine, the ultimate pragmatist, narrows the field to four Colonels. As the Russians and dreadful weather conditions wear down the French army, it becomes ever harder for Margont to focus on his task and to convince others of the significance of one death when death constantly threatens all of them. The author ably combines the two elements of murder investigation and epic war novel, providing the reader with the historical background in a convincing but naturalistic way that does not interfere with the flow of the story. I look forward to reading further novels featuring Captain Margont.